Did You Think We Gave up on the Garage? The least important room in our house has had the most attention over the past year. 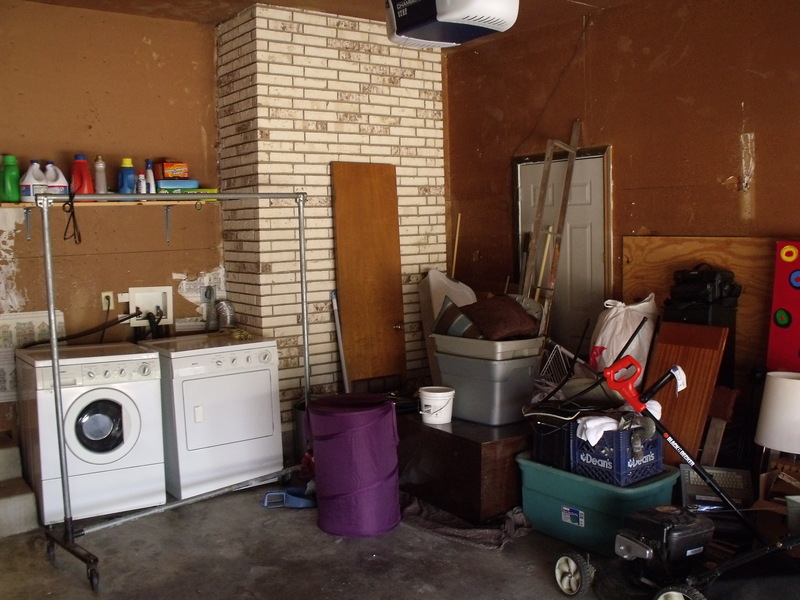 Here’s a picture of the garage before we owned the house. 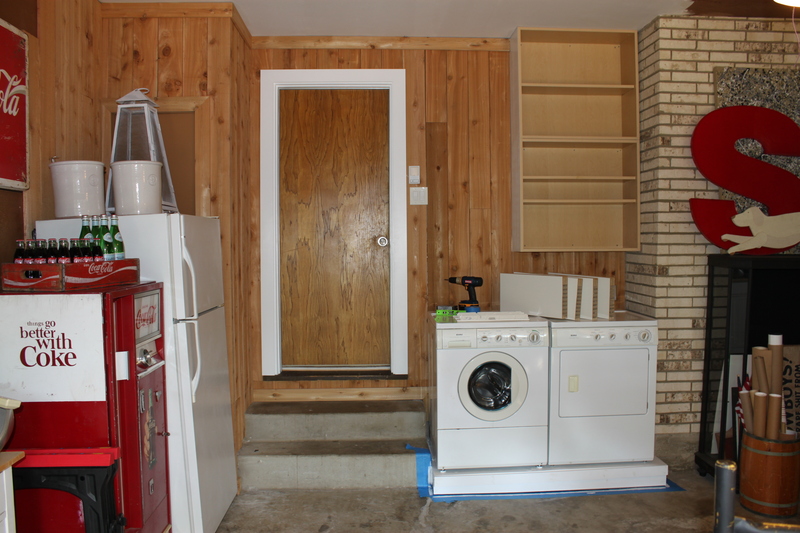 Notice the wimpy little shelf over the washer/dryer. That’s probably why everything else is on the floor. I hung 4 laminate shelves after we moved in. Functional, yes, just not thrilled about still seeing all that crap. 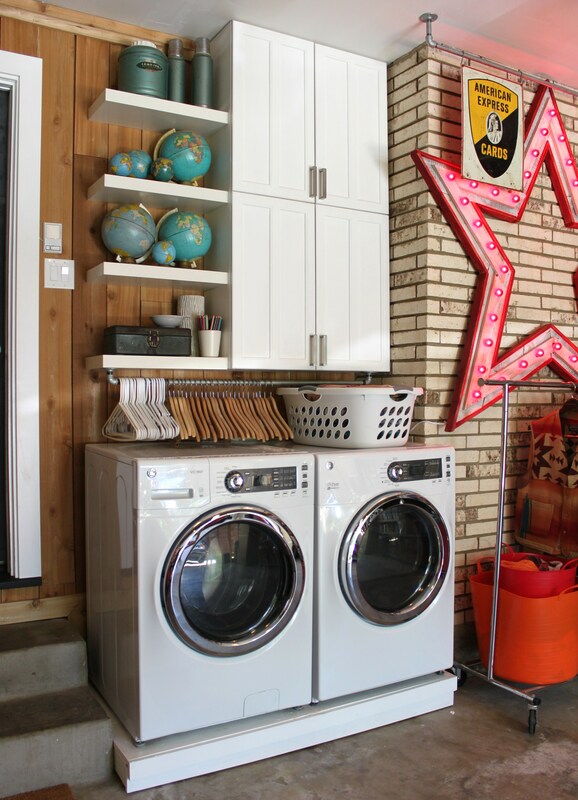 The washer and dryer needed just a little lift, so we gave them one. 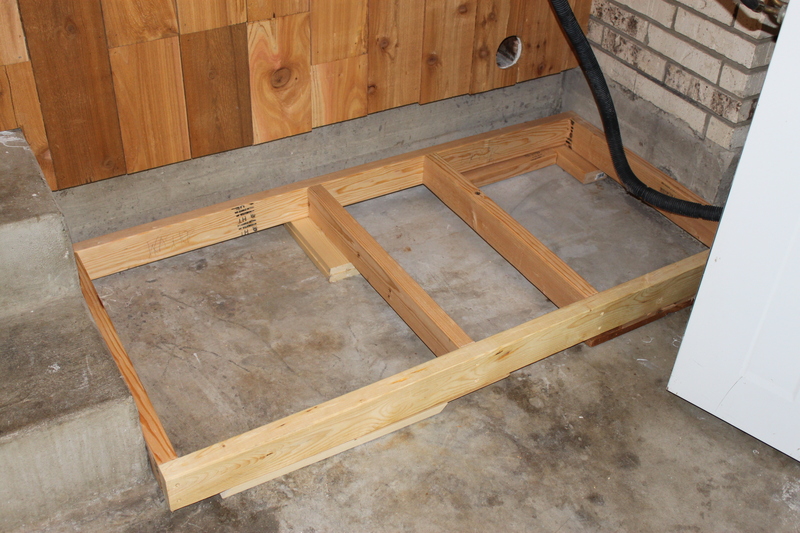 I started by building a platform with 2X4’s and shims to level it out on the uneven floor. The hole in the cedar is for the dryer exhaust. 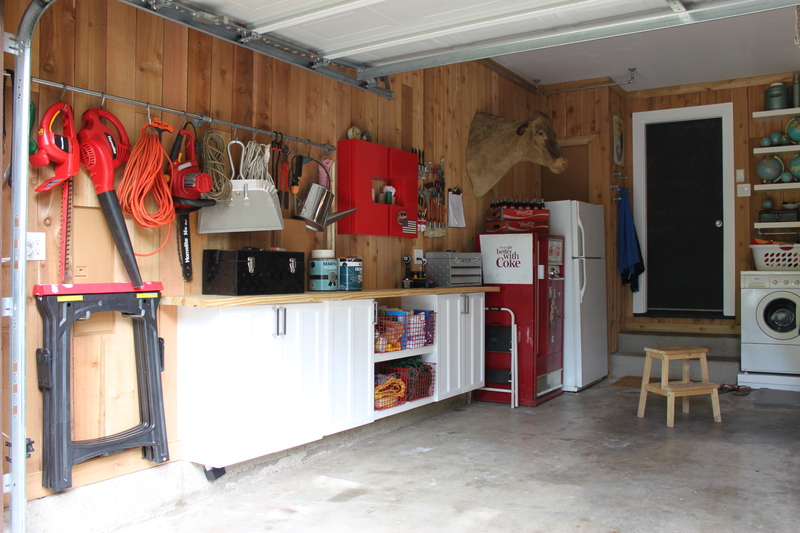 Using “Every part of the buffalo” the old garage shelves became the platform. Then a nice coat of white paint. Everything looks “cleaner” painted white. The front of the platform got a few little trim pieces. Notice how the platform gets wider to the right, but the trim stays the same….y’all never would have noticed if I hadn’t pointed that out. This whole side of the garage looks so much better already. That was about 9 months ago, Today it looks even better. 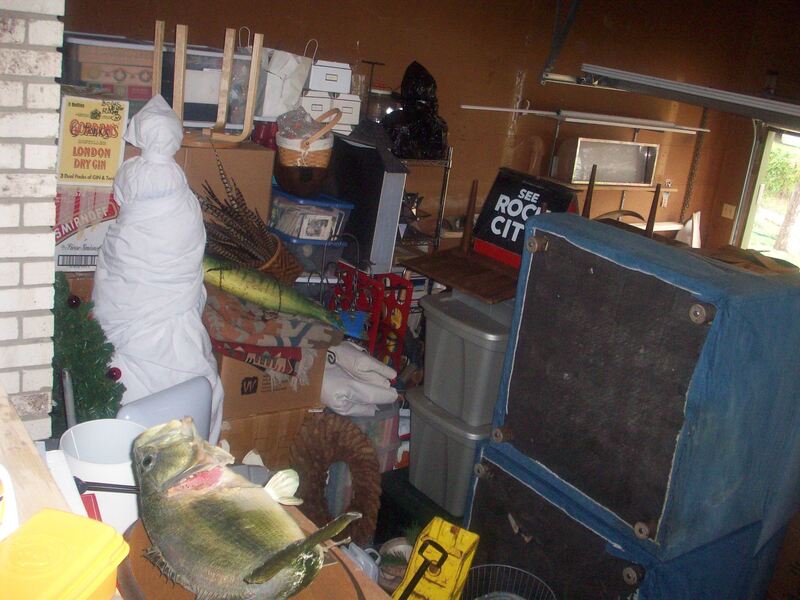 Here’s what we started with, completely uneventful, the kind of room that one would expect to find a live rat in…. That huge barn wood star we made last fall has a perfect home on the chimney brick wall when it’s not hanging in front of the house. 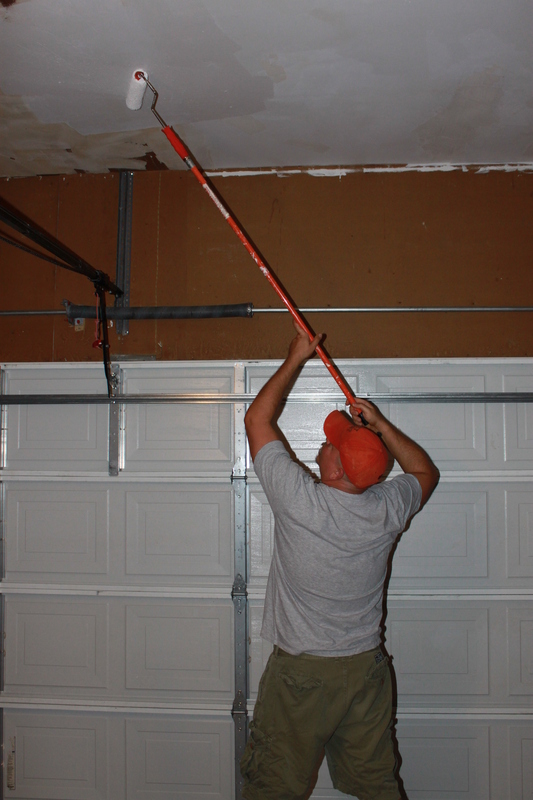 We added more plumbing pipe to the ceiling to match the left side of the garage. ….and the wall of metro shelves along the wall to contain the hoard. Most everything is contained in neat, labeled tubs. The PHARMACY sign has been in a pile for about 3 years now just waiting for a home. Now they have one on the cedar wall. The cabinets came from the kitchen remodel. No way would we ever think to waste those. And the Ikea Lack shelves we sliced in half and hung off of them. Notice the plumbing pipe to hold hangers. New platform for the new washer/dryer. The old ones finally gave out a few months ago. 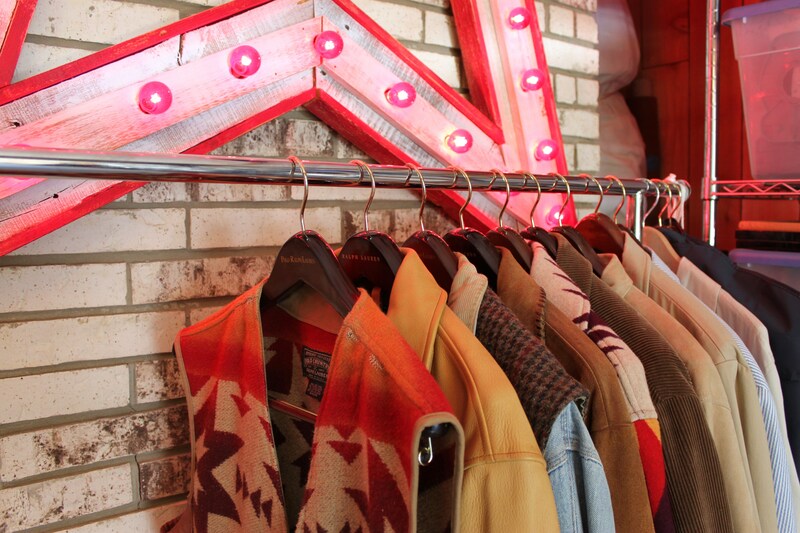 The rolling rack, everyone should have a rolling rack, is for out of season jackets and even better….clothes can be hung-up directly from the dryer. More of the former upper cabinets from the kitchen, tool magnets, and open storage in wire baskets between the cabinets. What used to be a dank, nasty storage room is now a clean, bright space where we spend most of our time working on projects. The Pendant lights went up last month…..more on those bad boys to come. 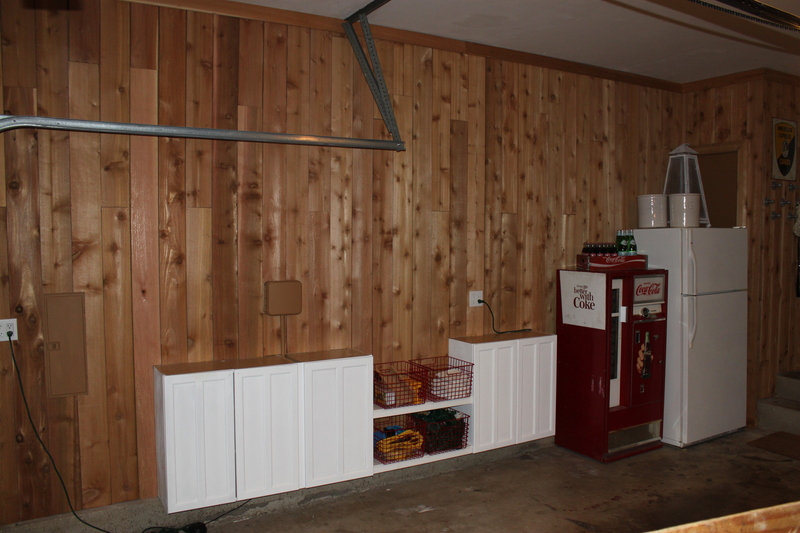 This is a follow-up to the posts on Cedar Planking our garage and Installing the Lack Shelves over the washer and dryer. 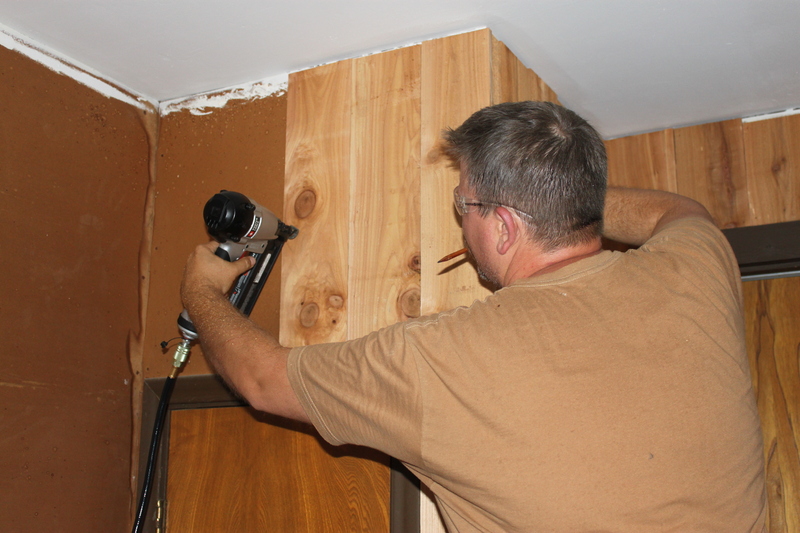 We had hung our old kitchen cabinets along the left side wall and started planking cedar over the unpainted drywall. Over the hottest of the Texas months, working a little at a time, we slowly got to this…. 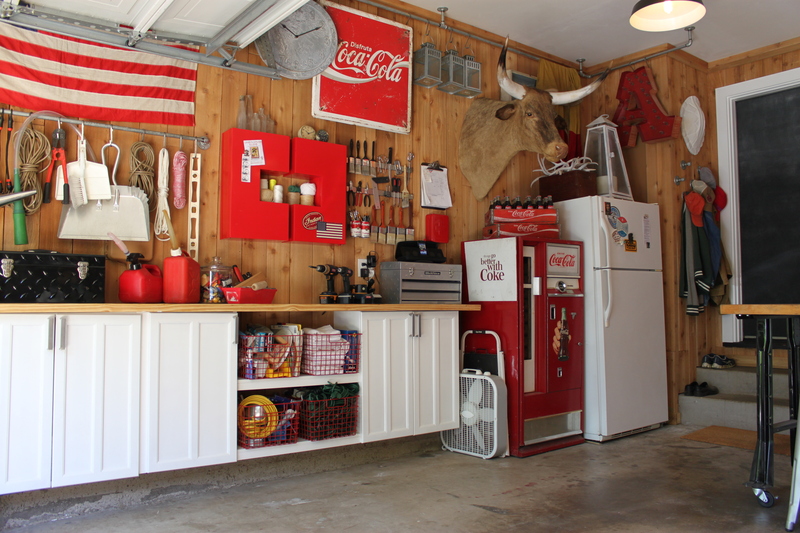 “Pure Coolness” in a garage, am I right? We topped the cabinets the cheapest way that we could think of, with framing lumber. Total cost was about $12. 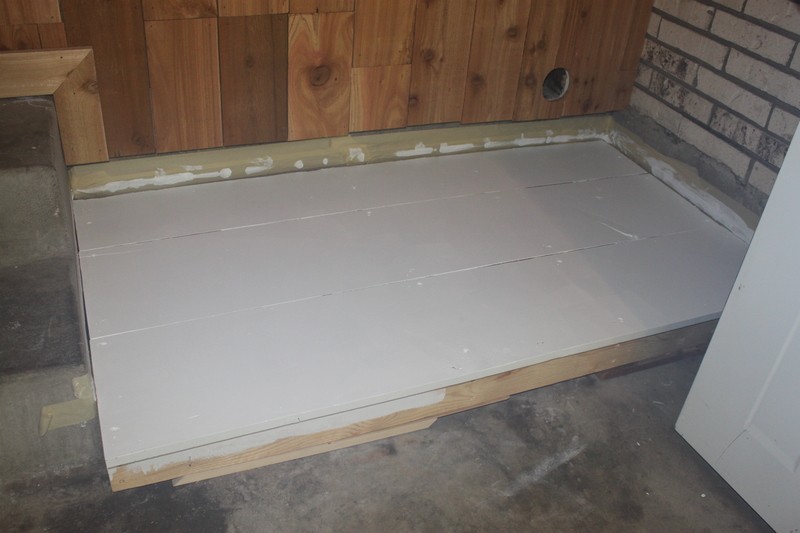 This was the only way we could get a 14 inch deep counter that was 10 feet long. It’s not a super efficient workspace, but it is just the right size to drop paint cans and open tool boxes. 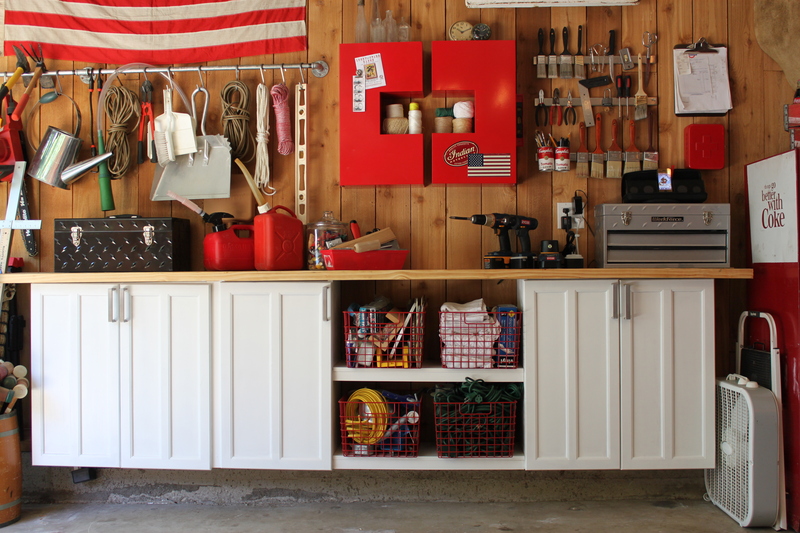 Besides, there is a decent sized work table in the middle of the garage that is always covered in “assorted important stuff”. 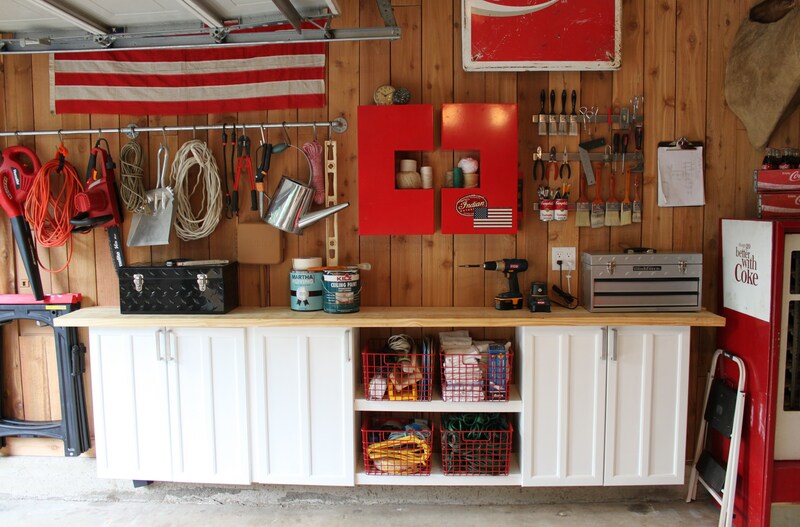 Here are a couple of “steal-able” ideas to make a garage workspace a little more efficient. Ikea, I know another plug for Ikea, sells knife magnets for the kitchen. 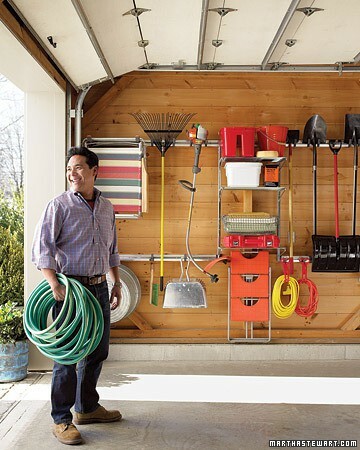 Why not use them in the garage too? 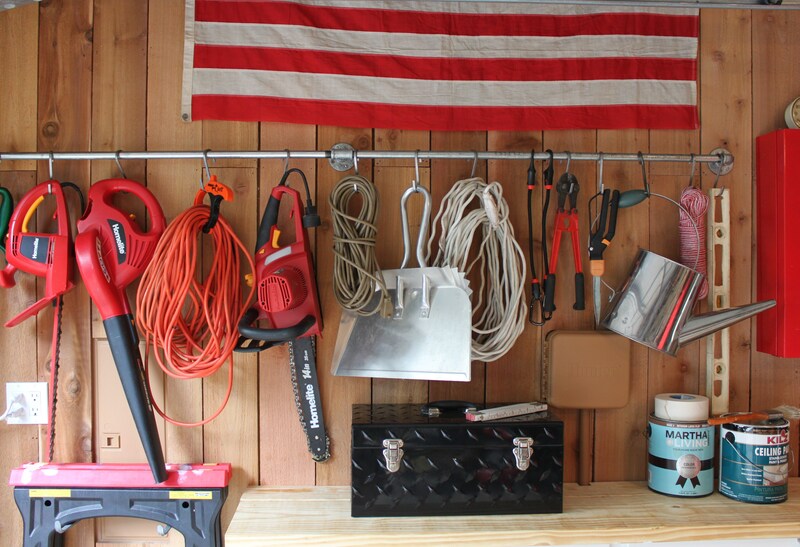 Now we have a perfect place to hang the things we usually have to rummage through several toolboxes, or drawers, to find. Needle nose pliers, sharp scissors, paint-can opener…..Yepp, right there. There is also no better way to dry paint brushes. Tomato soup cans hung on the magnet strip are the perfect place to put pens, pencils, and paint brushes. They don’t really take up that much counter space, but they are just easier to find at eye-level. And yes, I choose the cans for the red color….and a slight nod to Andy Warhol. We built open shelves to lengthen the counter top space because we only have about 7 feet of cabinets. 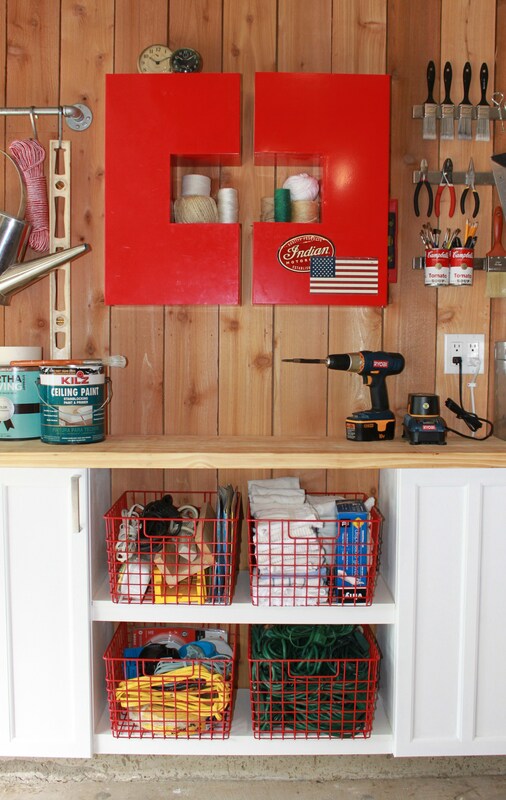 Cool, red baskets wrangle extension cords, shop towels, rubber gloves, and assorted electrical supplies. If we can see it, we can find it faster. The minute I saw those baskets I knew I’d find a home for them somewhere. 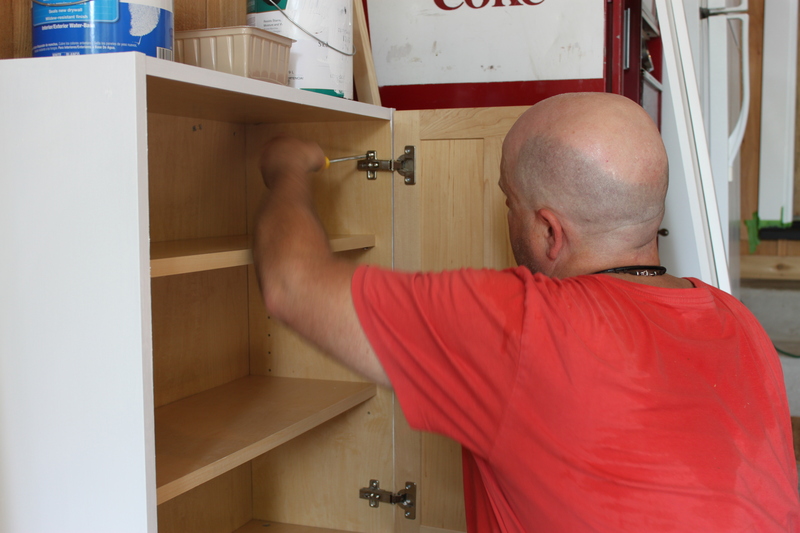 Our friend Jimmy was getting rid of these “C- Shaped” metal medicine cabinets. 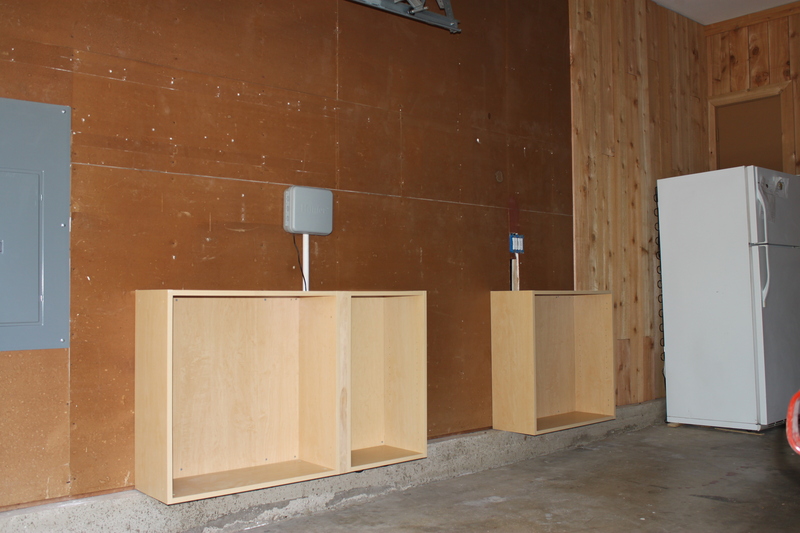 We have other plans for the bathrooms, but they work great here…..
All those little things have a home now. Upcycled salsa and baby food jars are unmatched for holding screws, nails, thumb-tacks, jingle bells…….pretty much anything. 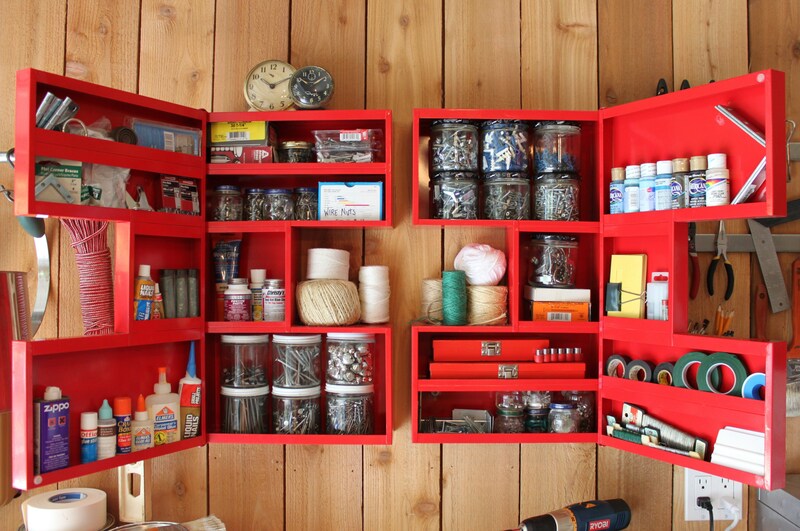 The baby food jars filled with metal fasteners always remind me of my grandfather’s tool shed. It was shaped like a red barn with an American eagle plaque over the doors. I still need to get in there with a label maker, (Lord knows that I LOVE a label maker), but I’m pretty confident that everything is easy to find now. There are more uses for plumbing pipe then just making shelf fixtures, firewood holders…..or for actual plumbing I suppose. 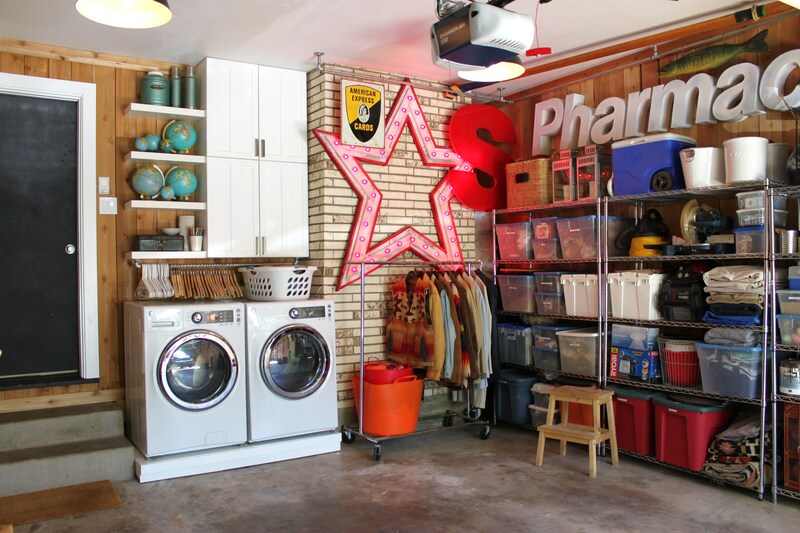 Try strapping one across a wall with toggle bolts and using hooks to hang necessities. 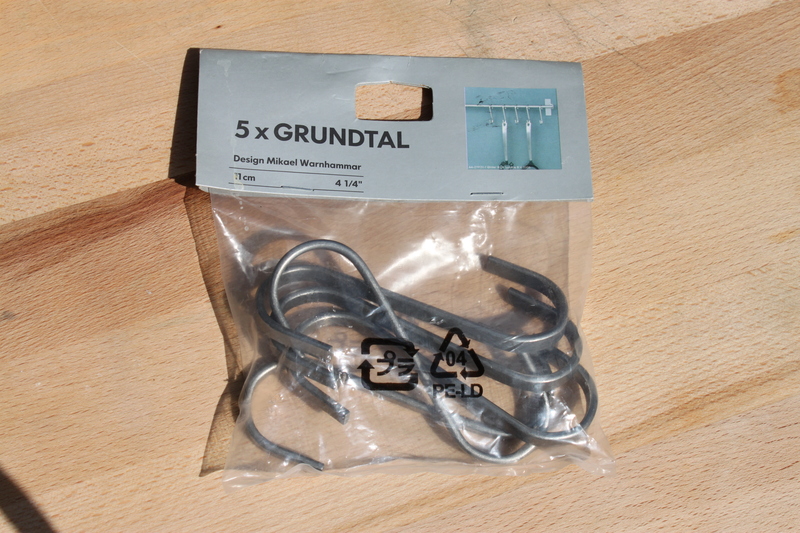 We used kitchen pot hooks (from, you guessed it, Ikea) to hang all those odd-ball things. They are only about 1$ each. 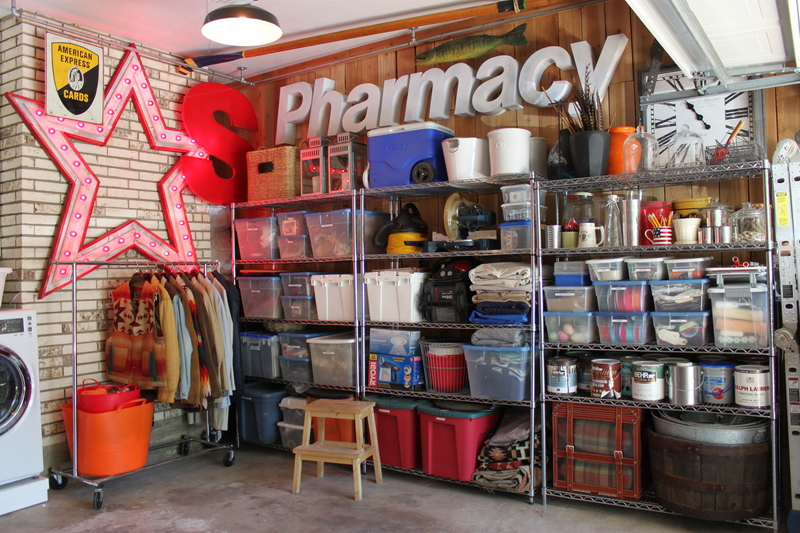 Now that the garage is clean-ER, we can hang all those things that haven’t quite found a place in the house yet. 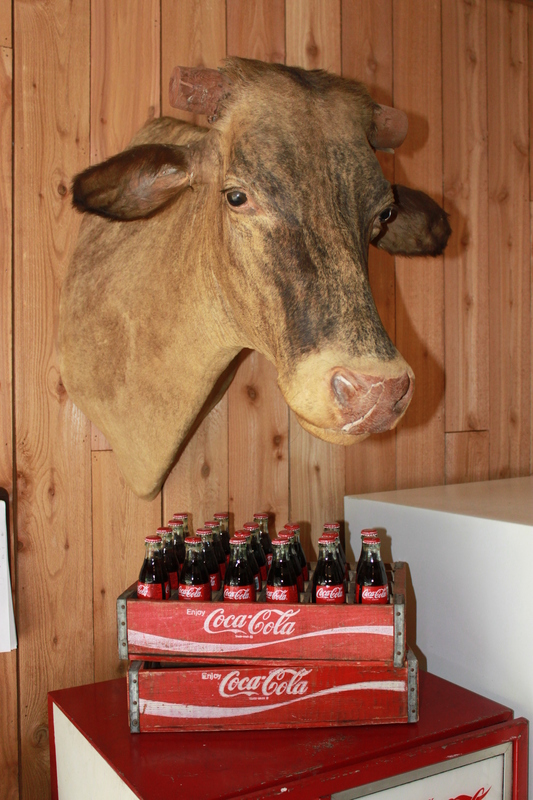 Like this “longhorn-less” longhorn hanging over the old Coke machine. Wouldn’t y’all just expect there to be extra horns just laying in the streets of Dallas? Well, there aren’t. But someday I’ll find a replacement set for him. We have barely even started planking the right side of the garage…but we do have a few more projects out here to show off. I don’t want to ruin any surprises…but we found a few unexpected places for storage. Combining the households of 2 grown men is not an easy task. Like we did a little over 2 years ago. 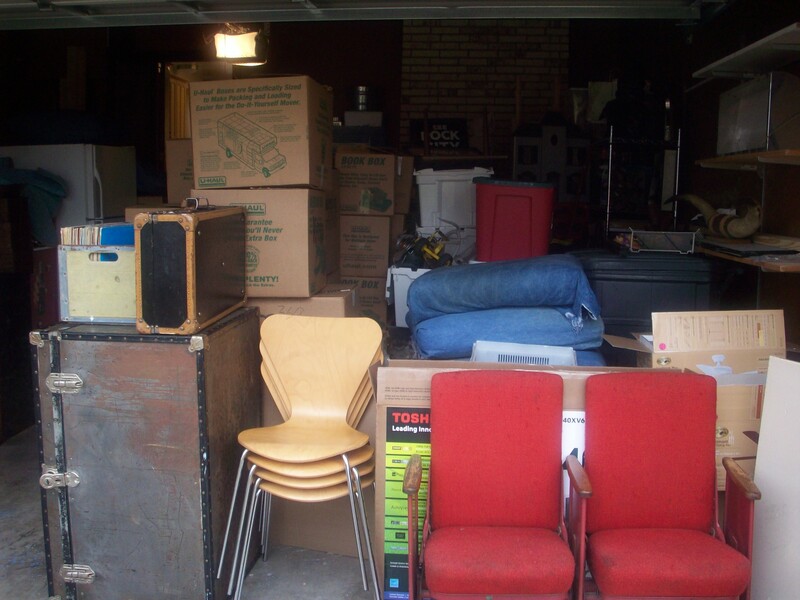 Our garage, just like yours I’m sure, was a total dumping ground for everything that didn’t have a place in the house. 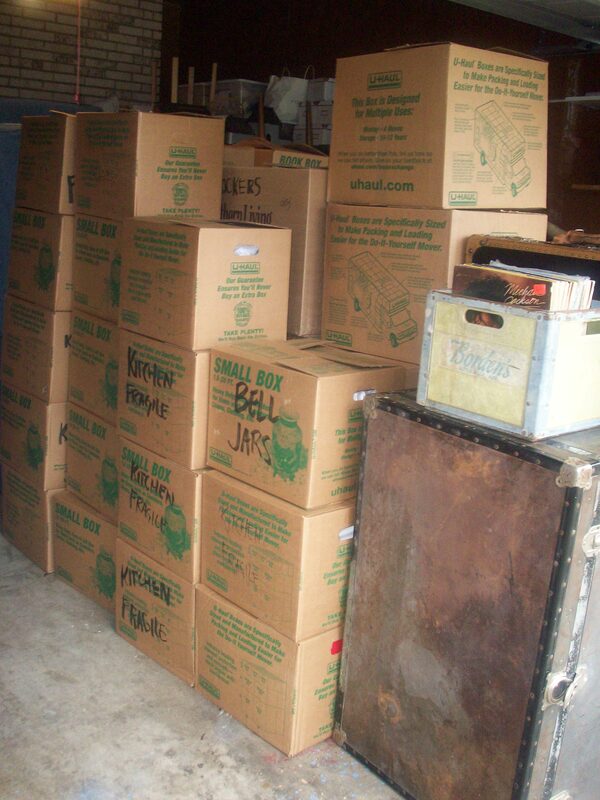 Get this, we actually piled all our crap to the ceiling in there. It’s almost too embarrassing to show…but I’m gunna show you anyway. But where else are we supposed to keep our taxidermy bass? or “See Rock City” bird house? or the old theater seats? 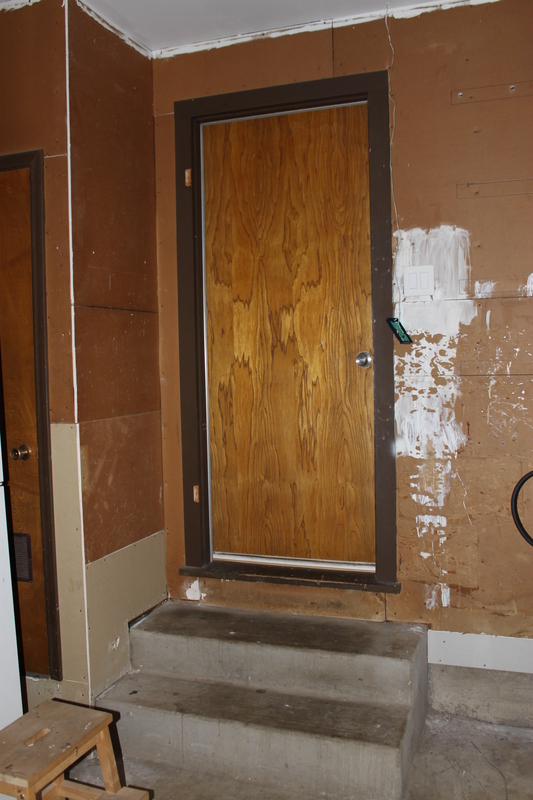 We did manage to keep a small (someone call for a Hoarders intervention)path from the door to the outside world. Not too bad, but not something we are particularly proud of either. We still can’t fit a car in there. I don’t even have a picture of all the “stuff” pushed to the side out of camera range. 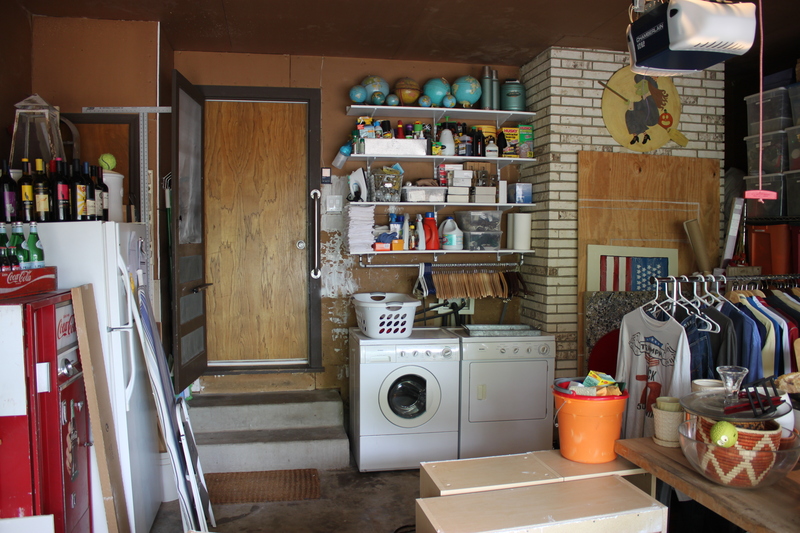 The mess is mostly contained, but the whole place is still so…… unfinished. The walls and ceiling are just plain 1970’s sheet rock. They never even did a tape-and-bed job. 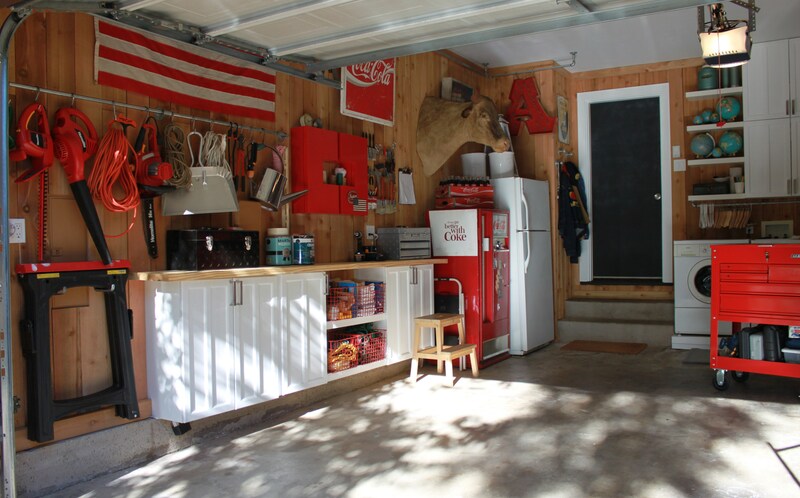 A little modern, a little vintage, a little wooden, a little functional garage……that’s where we were headed. And what did we like the most about our 2 inspiration photos? The wood, that’s right. Fencing cedar is pretty cheap. About 3 bucks for an 8 foot board. Every time I made a trip to H-Depot I picked up 10 boards. 30 bucks a pop, not much of a bite. We used it before on the front of our house to make thick columns and cover the ceiling of the patio. Both projects we are still just Ga-Ga about. 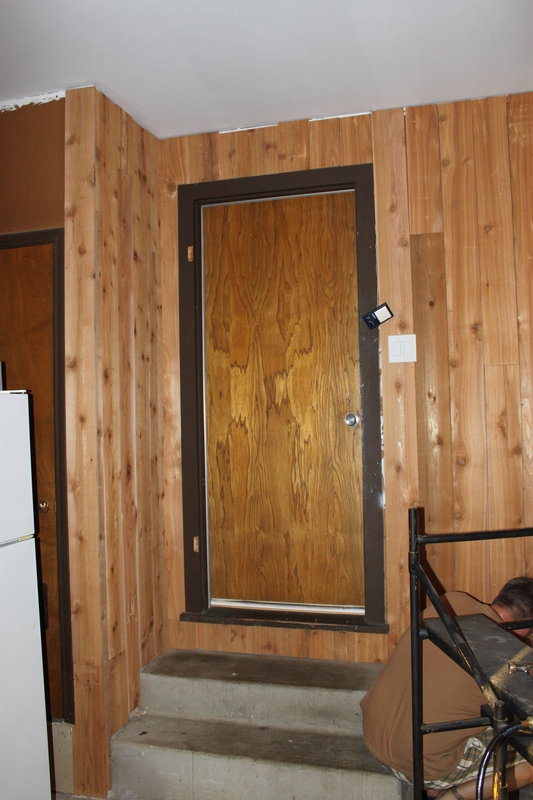 To this, in a few hours….We still need to trim the door in white moulding. And add the cedar crown moulding. (Crown moulding in the garage, aren’t we fancy?) And Jamie has something planned for that door to the kitchen too. The wood tone distracts too much from our B-U-T-ful cedar. 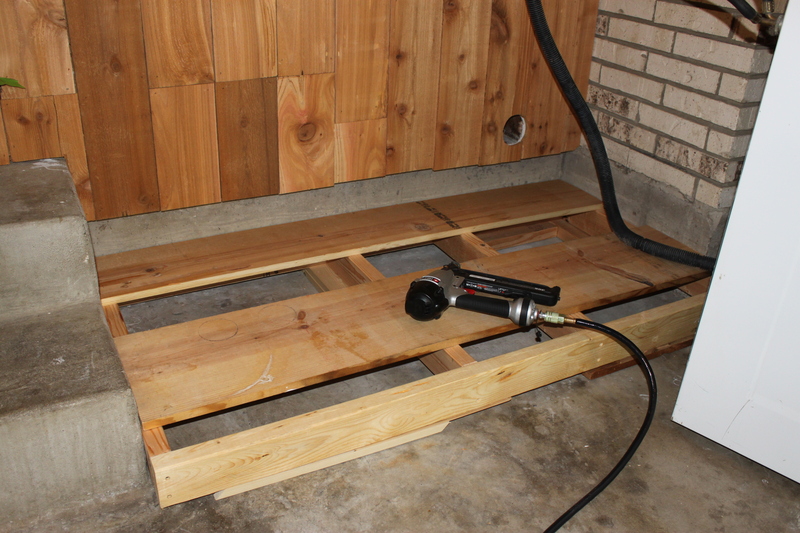 I can not live without my air compressor and brad gun…. Best Investments Ever..
After the kitchen remodel, we saved the old upper cabinets (in the garage natch’) to wrangle in some of the clutter. 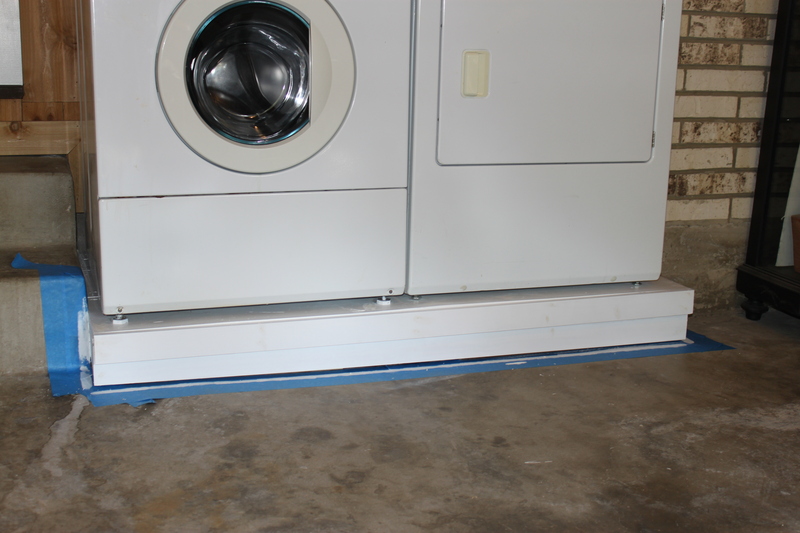 2 of them went over the washer/dryer (y’all can see that amazingness here)…..and the others we hung along the foundation at a perfect counter height. 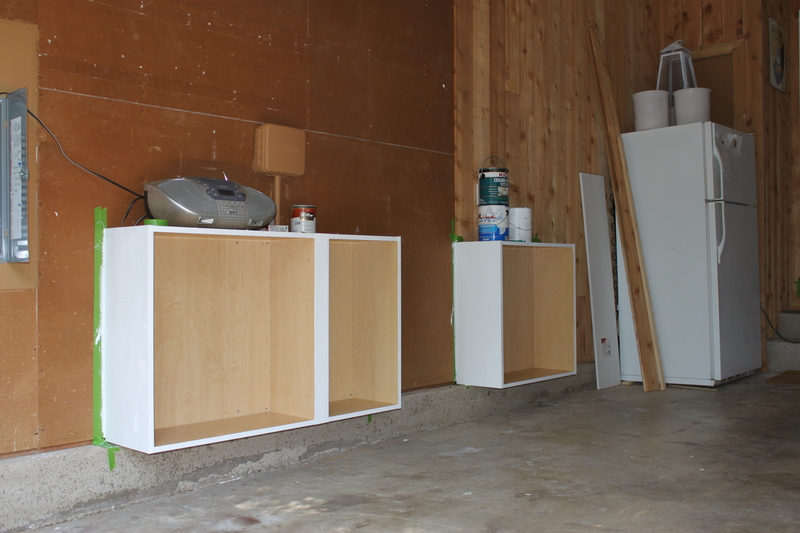 They are shallow, because these are upper cabinets and only 11 inches deep, but that will keep the garage looking more open. 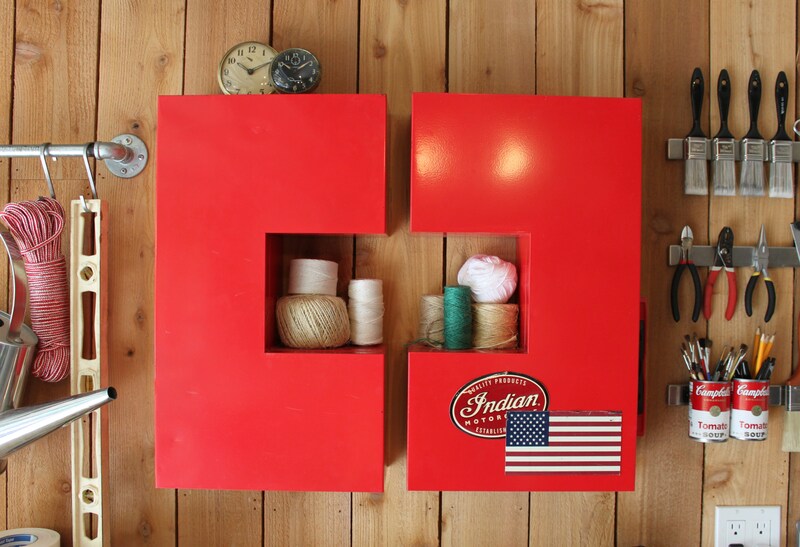 Here’s the upcycled kitchen cabinets hung along the base of the left side wall…. And after taking the cedar along that whole wall and adding the cabinet doors. Notice how the sprinkler control and electrical panel were painted khaki to blend in with the cedar….Pretty clever, an I right? Who wants to see things like that? Not us. That’s for darn sure. This is just the beginning of this “Mind Blower”. Wait till y’all see everything we have been working on out there.